There are more photos in the Critter Gallery. Most of the On30 railroad enthusiasts are well aware of the Porter Locomotive Works of Pittsburgh, Pennsylvania. For over eighty years, they specialized in building locomotives for industrial, agricultural, and construction operations. Many of them survive today, such was their popularity and durability. The story begins in 1866 when Henry Kirke Porter and John Y. Smith set up a machine shop on 28th street to build and repair industrial machinery. Their reputation for quality and accuracy grew quickly as did their ability to do custom work. The first steam locomotive order came March 4th, 1867 for the New castle Railroad & Mining Co. This was followed by orders for 43 more similar locomotives, Porter & Smith specializing in small, four drivered, tank locomotives. Among this first series of engines was the famous "Minnetonka," now preserved operational at the Lake Superior Museum of Transportation in Duluth, MN. Disaster struck the young firm with a fire in the 28th street shop in 1871. Twelve locomotives were destroyed and $200,000 worth of damage done. This led to the breakup of the Porter and Smith partnership. Rebuilding and expanding the original works, Porter next partnered with Arthur W. Bell to create Porter, Bell & Company. The first locomotive under the new partnership went to the Jackson Furnace Company of Michigan. Specializing not only in industrial locomotives, but also freight engines and even 4-4-0 types for light passenger work in both standard and narrow gauges, the new company built 223 locomotives before Bell's death in May 1878. Porter continued the business as the H. K. Porter & Company, establishing a reputation for building rugged and durable steam locomotives and industrial equipment. He also devised a system of standardization wherein all parts were "interchangeable." A customer could telegraph an order for any part of a Porter locomotive or machine, and it would be shipped from "stock" as soon as the next day. With such standardization, Porter could also fill custom locomotive orders from parts on hand assembled in various combinations. For many years, some complete locomotives were built and stocked for rapid shipment! Any customer could buy from the Porter catalog, and be literally buying "off the shelf!" 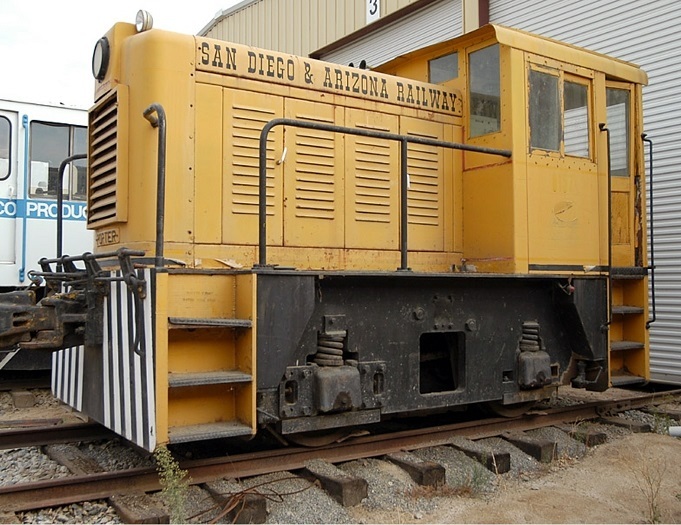 This, along with the reputation for quality and durability in even some of the roughest conditions of industrial usage, made Porter locomotives a top choice for loggers, miners, plantation owners, earth moving contractors, and plant operators. 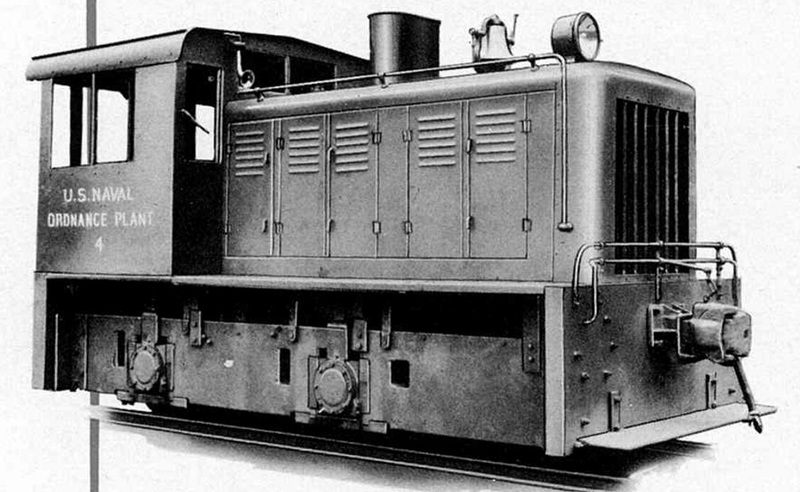 In 1890, Porter entered the new field of Compressed Air locomotives. These were being used to replace manpower and mules in underground operations or where fires for steam power were not safe. Porter's first compressed air engine went to a nearby Pennsylvania coal mine (no surprise.) Ten years later, Porter had built 400 such locomotives and had 90% of this market! Despite expansions of the 28th street plant and satellite operations set up around the city, Porter's expansion into the export market and growing business in industrial locomotives forced a move to a much larger plant at 49th and Harrison Streets in 1899. Porter Locomotives would eventually serve in no less than 26 nations and their industrial equipment was sold worldwide. By 1906, even the new plant was almost at capacity with about 400 locomotives being built that year. Other works were set up in Blairsville, PA. and New Brunswick and Newark, NJ. to handle locomotive parts and industrial equipment. In 1911, Porter ventured into internal combustion powered locomotives, eventually building several sizes. 1915 saw Porter building its first "fireless" locomotives using a pressure vessel in place of a boiler. "Charged" by plant steam, these engines fast replaced the compressed air types due to their superior power and range. Soon Porter dominated this market as well. Following the First World War Porter was the favorite of industrial locomotive users. Grading contractors used engines as small as 6 tons to pull trains of tipper cars. 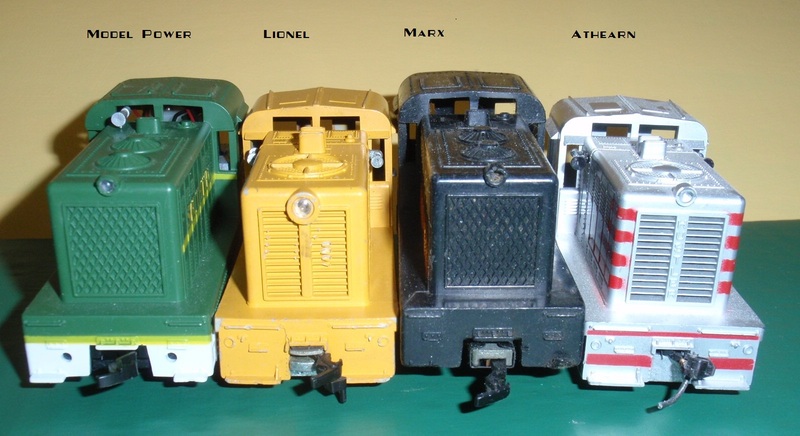 The smallest Porter tank engines were shorter than the average pickup truck today but weighed at least three tons more and had FAR more pulling power. It would not be until the widespread use of internal combustion powered "heavy equipment" in the thirties that sales of the smaller Porter locomotives would fall off. Old H. K. Porter, still running the company at age 81, died April 10, 1921 at the height of the company's success. The Depression hit all locomotive builders hard, but Porter perhaps even harder. The company struggled on, but finally declared bankruptcy in 1939. Thomas Mellon Evans, of the Mellon Banking family, stepped forward to take over the famed Pittsburgh company. He purchased other companies and added them to the "new" Porter empire. Because of this expansion, World War Two found Porter in an excellent position to take on war work. By then, the locomotive portion of the company could build seven types of internal combustion locomotives from 16 ton 4 wheel types to 100 ton two truck beasts. Steam locomotives were available in sizes from 12 ton, 4 drivered tank engines to 87 ton 2-8-2 Mikado tender type locomotives. Fireless engines could be had from 7 to 60 tons; the last order was two 45 ton engines for Nylon Corporation during the war. The H. K. Porter Company won War Production Board awards several times. Once in 1942 they built a dozen 60 ton 2-8-2 tender locos for the U.S. Army in three weeks. But soon after the war, H.K. Porter was really just a holding company for the many enterprises Evans had placed under its roof. One portion of the remains of that is known today as Porter-Cable. 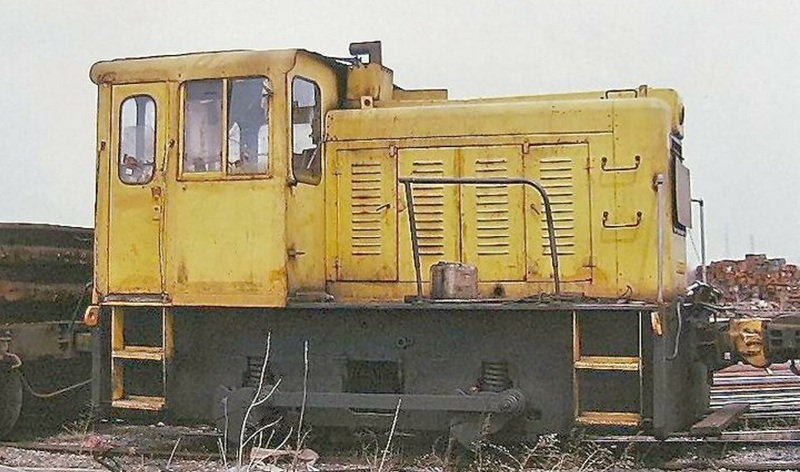 The last locomotive Porter built was a diesel for a Brazilian industrial firm in 1950. Shortly after, the parts business and all patterns required for it were sold to the Davenport Locomotive Company in Iowa. Davenport actually supplied parts for Porter locomotives for years afterward. about a variety of trains and other mechanical delights. Athearn made theirs first in the late 1950's. The model was named "Hustler". 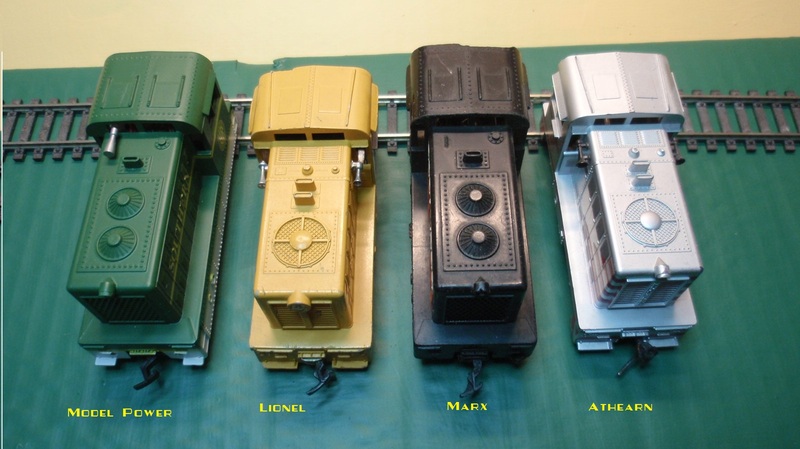 Lionel used the Athearn molds with some modifications - all in the 1960's. They started out with the Athearn mechansim and later switched to their own. Lionel called their little locos "Husky". Marx made their own molds and mechanisms - also in the 1960's. Model Power used the Marx molds and have had a couple of versions of their own mechanisms. Model Power is still available. The following photos show examples of the four brands of HO. There are more photos in the Critter Gallery with other scales as well. Site and Pages Copyright 2011-9 - William P. Porter --- Some content belongs to the indicated provider.